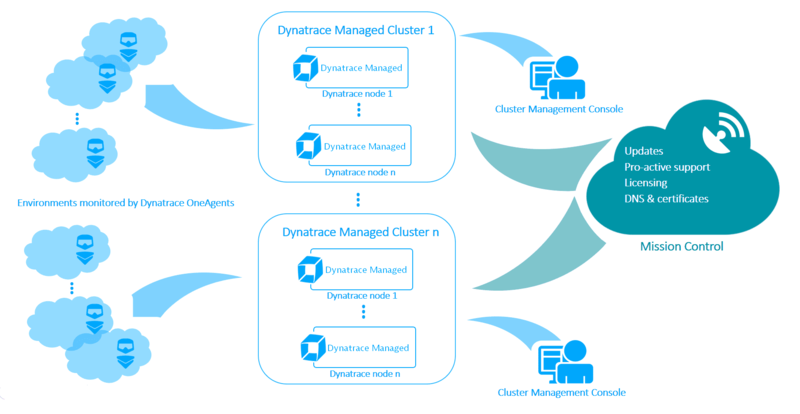 The basic Dynatrace Managed components are illustrated in the image below. Each time you want to set up a new cluster, you need to obtain a license. All your Dynatrace Managed clusters communicate with Mission Control for maintenance and licensing issues. Dynatrace Server is installed on the first node that you create when setting up your cluster, as well as on any additional node. For each Managed cluster you set up, there is a dedicated Cluster Management Console. Cluster Management Console is a web-based user interface for efficiently managing your Dynatrace Managed infrastructure. 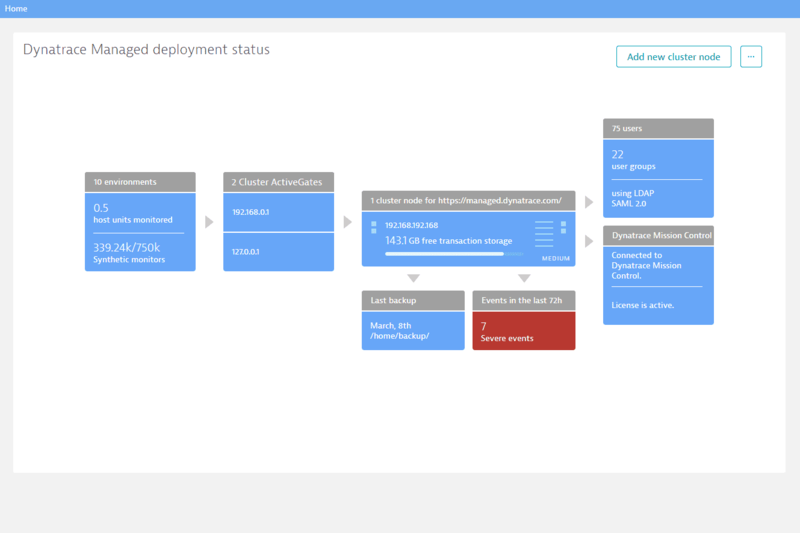 From here you can view the deployment status of your Dynatrace Managed cluster setup at any time. Dynatrace Mission Control provides pro-active support for maintenance and licensing issues. With automated support from our Mission Control team, your Dynatrace Managed installation is updated automatically. Our Mission Control team can also help you with troubleshooting if you run into problems. Dynatrace OneAgent is installed on each monitored environment. Dynatrace OneAgent is responsible for collecting all performance data within your monitored environment and sending the data to Dynatrace Server.